By now you should realise that I am crazy about a little stretch of Africa known as Mana Pools. Not only is it a place of immense beauty and a real sense of wilderness, but the fact that you are allowed to traverse the floodplains on foot at will (and at own risk, I might add) brings a whole new dimension to your safari experience as well as the kinds of photos you can capture. 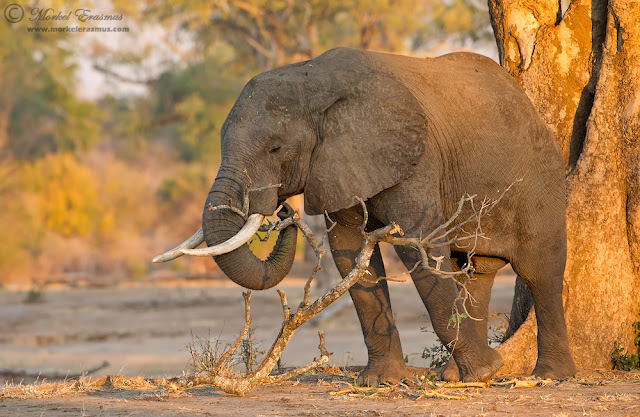 We spent some time with a trio of elephant bulls one afternoon, during which the oldest one would regularly get up on his hind legs to break off a branch from the highest albida trees around (see more of that behaviour here). The other two would then come closer and feast with him. This photo shows one of the guys snapping the branch after they'd stripped the leaves from it. On the high resolution photo you can see the bark splintering as well. Shooting with a 500mm lens meant that I had to keep enough distance between myself and the big boys to be able to compose the frames properly.